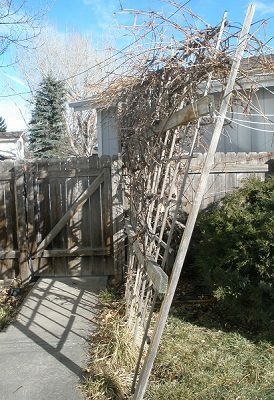 The wind broke the main post of my grape trellis off at the base this winter. It’s leaning precariously, but tied to the aspen tree to make sure it doesn’t collapse across the sidewalk. Poor broken thing. I’ll be taking it down piece by piece as soon as the rains stop and the ground dries a little. Sadly, the old grape vine is going to bite the dust as well. I haven’t really used the grapes for much over the last few years anyway. I still have bags of cleaned and stemmed grapes in the freezer from 2014 that will probably end up in the trash. I’m not going to miss the work that comes with harvesting grapes and making them into jam or juice. 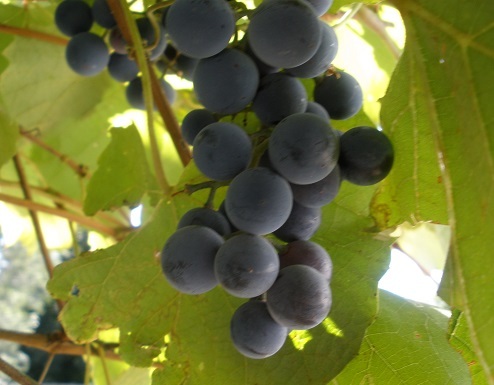 But I will miss the wonderful scent of ripening Concord grapes in the fall. I have plans to make up for losing the grapes. More flowers to attract butterflies, new lavender plants and rose bushes for their perfume and their beauty, and a new tree for the back yard. I already dug up some of the old iris corms and day lily bulbs and transferred them to one of the raised garden beds that will be alive with colorful flowers this year instead of the usual veggies. I think my priorities are changing….